JT from Chicago, IL is newly trained and ready to apply for jobs as a welder but needs his own safety equipment to qualify. JT knows the gear will cost over $285, which is more than he can manage. What types of needs does Benevolent help with? How can I get help with my need? JT trained to become a welder at the Jane Addams Resource Corporation (JARC) for several months. Eric, JT's Welding Instructor, knows JT will need safety equipment to start his new career, but JARC doesn't have funds for personal safety equipment for each trainee. So Eric works with JT to share his story on Benevolent to try to get help with this challenge. How can I become a Beneveolent validator at my organization? I'm already a Benevolent validator. How do I post a need? 3. 3. Donors contribute, then Benevolent sends funds to the validator. 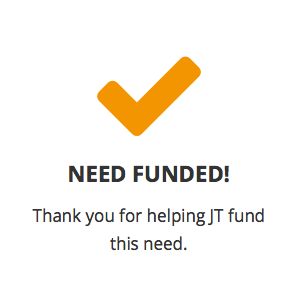 Nine donors contribute a total of $285 to help JT get the safety equipment he needs. Inspired by his story, people send JT encouraging notes of hope and well wishes. Benevolent sends the grant to validator Eric at JARC to meet the need and they make sure JT gets his safety gear. What if a need isn't fully funded? How much money goes to needs? With his safety equipment, JT can apply for jobs, qualified and ready. JT is so excited to have the gear he needs that he writes a thank you note to all his supporters to let them know how much their contributions and encouragements mean to him. He even sends this photo so they can see the gear themselves. JT says "I know truly that myself and my family will benefit greatly from what you all have bestowed upon me." I want to help someone meet their need. You can take a peek at our currently featured stories to find someone for whom your contribution will make a huge difference. I want to become a validator! I am already a validator. What now? Sign in and post a need! If you have a co-worker new to Benevolent, you can request an account »on their behalf. I have a personal need. Needs are posted by validators. If you're an individual hoping to share your need on Benevolent, you can find a validating partner in your area or ask a helping professional in your area to sign up.